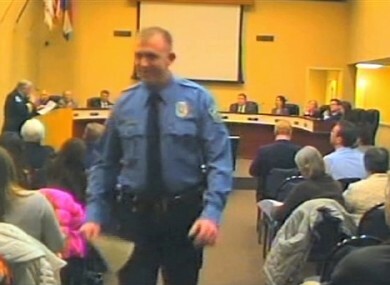 In this February, 2014 file image from video released by the City of Ferguson, Mo., officer Darren Wilson attends a city council meeting in Ferguson. THE POLICE OFFICER who fatally shot an unarmed 18-year-old in a St Louis suburb last summer has told investigators that he was pinned in his vehicle and in fear for his life as they struggled over his gun, The New York Times reports. Ferguson, Missouri, police officer Darren Wilson has told authorities that Michael Brown reached for the gun during a scuffle, the Times reported in a story posted on its website Friday night. The officer’s account to authorities did not explain why he fired at Brown multiple times after emerging from his vehicle, according to the newspaper. 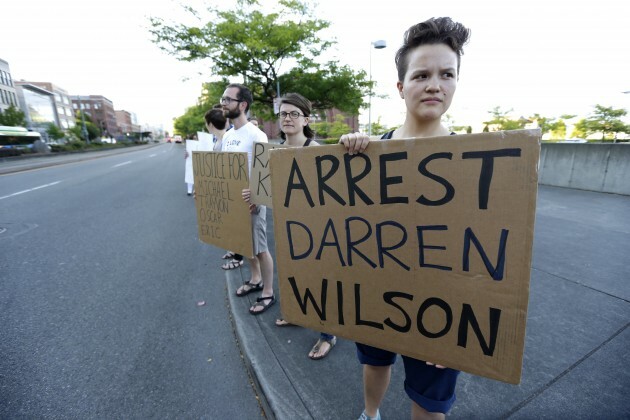 The Times reported that the account of Wilson’s version of events came from government officials briefed on the federal civil rights investigation into the 9 August shooting that sparked racial unrest and weeks of protests, some of which turned violent. Wilson is white and Brown black. Wilson confronted Brown and a friend while they were walking back to Brown’s home from a convenience store. After the shooting, Brown died at the scene. Some witnesses have told authorities and news media that Brown had his hands raised when Wilson approached with his weapon and fired repeatedly. An independent autopsy commissioned by the family says that Brown was shot at least six times, including twice in the head. The Times reported that Wilson has told investigators that he was trying to leave his SUV when Brown pushed him back in and that once inside the vehicle the two began to fight. Wilson told authorities that Brown punched and scratched him repeatedly, leaving swelling on his face and cuts on his neck, the Times reported. Wilson, who had been patrolling Ferguson for nearly three years, was placed on leave after the shooting. A state grand jury is considering charges against him. The Justice Department is investigating the Ferguson Police Department for possible civil rights violations, including whether officers there use excessive force and engage in discriminatory practices. Two-thirds of Ferguson’s 21,000 residents are black but only three of its more than 50 police officers are black. Email “Police officer who shot unarmed black teen says he 'feared for his life'”. Feedback on “Police officer who shot unarmed black teen says he 'feared for his life'”.